Since the Steve Balaban interview, I have had calls from other folks that have read my book, taken the course or gone to Boot Camp, to relate their stories. And I was very impressed. 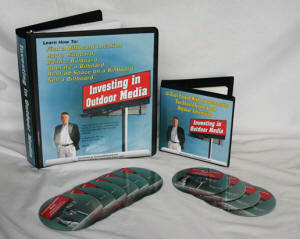 One person who contacted me recently has built over 50 billboards since taking the course. I love to hear stories like that, as it makes me feel like I’ve not wasted my time in teaching about how the industry works. If you have a story you’d like to tell, email me at [email protected] I’d really like to hear what you have going on! What Would I Do Today If I Had To Start All Over Again? I frequently get asked what I would do if I woke up tomorrow and had to start all over again. The answer is simple: wooden signs. These industry workhorses are completely overlooked today, and offer the highest return on investment of any type of billboard structure. Plus, they make complete sense for the advertisers, and offer a true win/win for the landowner, billboard owner, and advertisers alike. You can build a wooden sign for around $4,000 or less. A steel monopole, by comparison, costs around $50,000 (over 10 times more). A wooden sign rents for around $200 to $300 per month. But a monopole, in most markets, does NOT rent for ten times more, but only around three times more. That means that wooden signs have about three times as high a return on investment vs. steel monopoles. And that does not even take into account the borrowing costs and repair and maintenance cost of the monopole. A good wooden sign can return 50% per year, while a good monopole can return between 10% and 20%. So from a dollars and cents standpoint, wooden signs always win. Before you can have return on capital, you have to have return of capital – you can’t make money if you lose your billboard location to new development. With monopole signs, you are building on prime property in the big city, and the risk of new construction is always high. Wooden signs, however, are traditionally built on farms that don’t even have a frontal road – development is maybe 50 years into the future, if ever. So for sign retention, wooden signs always win. The number of legal locations that are appropriate for wooden signs vs. the number for steel monopoles is probably 100 to 1. It is infinitely easier to find decent wooden locations over steel locations. Since you have to find locations to build to get into the business, when it comes to fertile markets and speed of getting signs up and running, wooden signs always win. Since wooden signs have much more potential to find locations, it’s much easier to hit critical mass and make your goals come true. If you are trying to build a solid stream of additional income – or even a replacement for your day job – you will be able to do so faster with wooden signs. Just like you would not want to own just one stock in your stock portfolio, you would also not want to own just one billboard. Instead, you want to create portfolio diversity, which is a hedge to risk. It is much better off – from a risk adjustment standpoint – to have 10 wooden signs at $4,000 cost each to one $40,000 monopole. If you lose one of those ten wooden signs, you’re still fine. If you lose that one monopole, you’re bankrupt. Wooden signs traditionally have no lights. This means that you don’t have to worry about timeclocks breaking or bulbs burning out. They also are not painted structurally, so there’s no maintenance issue there. Because of their lower height, they do not get damaged as frequently in wind storms. In every single category, wooden signs offer less problems and worry. In times of economic recession, it is infinitely easier to rent a billboard for $250 per month than $2,500 per month. Wal-Mart’s success has been built on the concept of lower cost and higher volume. This is one area that wooden signs dominate. A wooden sign typically rents for the same amount per month as it costs for a one-time ad in the local newspaper. That’s an incredible deal for advertisers, and they know it! Most people are unaware that the major sign companies in the U.S. all began with wooden signs. Clear Channel was originally Foster & Kleiser, which was almost exclusively wooden signs when they began in the 1920’s. Lamar was once Whiteco, which was owned by the White family of Philadelphia and began life as the virtual in-house sign company for Holiday Inn, building wooden billboards to serve every Holiday Inn location in the early days. CBS Outdoor began as 3M National, which was almost exclusively wooden signs in the early days. In fact, the reason 3M owned them was because these wooden signs were the largest single customer of their reflective tape products. Wooden signs have a legacy of success. When I started out in billboard, steel monopoles cost $10,000 to $20,000, the locations were plentiful, and the rents were high due to a shortage of supply. I still built wooden signs back then, but steel was the best investment option. Times have changed. I believe that wooden signs are the best thing going in the billboard business, and that’s where I’d focus if I was to start again today.